Dividing perennial plants is an excellent, inexpensive way to plant more of your favorites or trade with other gardeners for new and different plants. Other times a plant simply outgrows its space, and some actually benefit from division and replanting every few years. If you notice that your hostas are starting to die back in the middle, or your irises aren’t blooming like they used to, try giving them a boost through division. 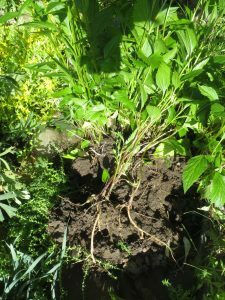 Many perennials form either expanding clumps with increasing numbers of stems, or make new, discrete clumps via above-ground rooting stems or structures that run horizontally underground. Still others can grow roots from stem sections, but often this is a more involved process; the best conditions for doing so are species-dependent and require a little research before attempting it. Ideally any tool you use to divide should be nice and clean. However, I don’t usually worry about this unless there’s indication that a plant is diseased, in which case you can use alcohol to disinfect the tool before using it on the next one. It is important that the tool be sharp, though. Even a spade can be sharpened to make a nice, tidy cut. Some people say to dig up a plant before dividing it. Personally I usually only do this if I need to see the underground structures in order to tease apart clusters while causing as little damage as possible to roots and stems, or when I’m not sure that the plant can be divided safely, and want to see what it looks like underground first. When dividing tough plants like daylilies and hostas, I simply try to find a line between the larger shoots to stick my spade and shove it straight down. The discrete clumps are, of course, the easiest to divide as long as they have enough roots and leaves to support the new plant. 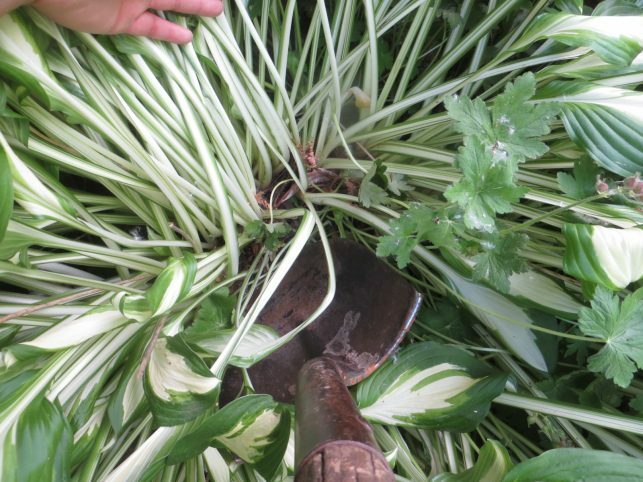 Simply dig up the plant you want to move then cut the attachment (or use your spade to cut as you dig). 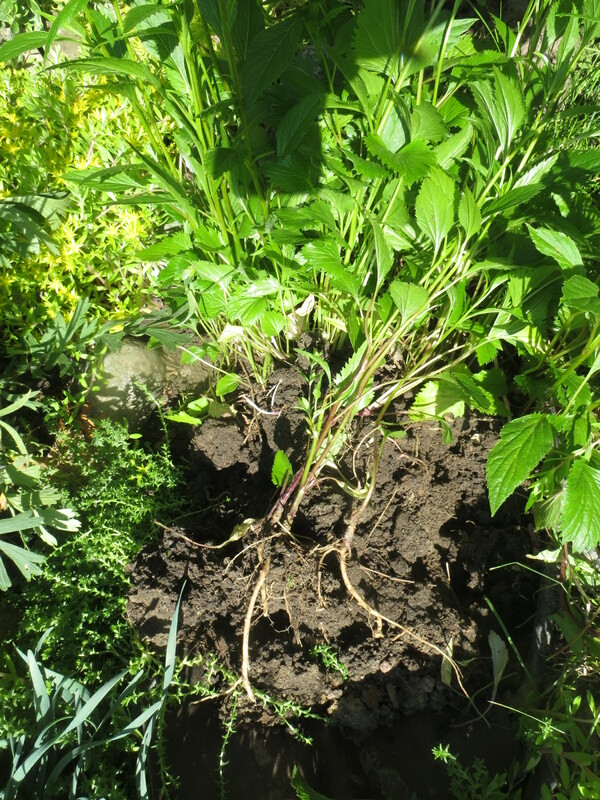 Sometimes if the plant has multiple shoots but the roots are intertwined and the soil doesn’t come off them easily, it can help to soak the roots for a while to get most of the soil off, so that the roots can be separated without breaking too many. When replanting after division, make sure they are well-watered for a week or so as they get established. As with transplanting, sometimes it helps to trim the shoot a bit in order to avoid water stress to the plant. That’s about it. It doesn’t work on everything, so before you go dividing your favorite perennial plants you might want to look on the internet to make sure, but often watching a plant’s growth over time is enough to tell you whether it’s safe to divide it. Once you have your perennials divided, here are our best tips on how to successfully transplant them into your garden.